After Saturday's 86-60 coldcocking of Kansas State, Andrew Wiggins' line as a freshman reads like this: 15.7 points, 5.4 boards, 1.4 assists. LAWRENCE, Kan. — If you happen to be one of the acolytes that expected Andrew Wiggins to consume the Big 12 with fireballs from his eyes and bolts of lightning from his backside, then yes, by golly, the dude is a disappointment. A complete letdown. "Ishtar" in adidas kicks. After Saturday’s 86-60 coldcocking of Kansas State, Wiggins’ line as a freshman reads like this: 15.7 points, 5.4 boards, 1.4 assists. "He did what he had to do. His team won," Kansas State senior guard Will Spradling observed after the 6-foot-8 Canadian put together arguably his most complete game as a collegian with 22 points, five rebounds and three 3-point makes. "Maybe he just thinks it’s more important to win than for him to go get 30." The Jayhawks didn’t so much as win Saturday as humiliate and dominate, handing their little brother to the west another basketball wedgie on national television. KU outrebounded K-State 33-25, shot 8-of-18 from beyond the arc, swatted away six Wildcat shots and committed just seven turnovers against 20 assists — and that ratio was a remarkable 0-to-14 in the first half. It was a throwback to early November, when No. 18 Kansas was beating Duke while No. 25 K-State was busy losing to the likes of Northern Colorado at home. The Wildcats (12-4, 2-1 Big 12) came in riding a 10-game winning streak; the Jayhawks (11-4, 2-0) returned home for the first time since being held to just 57 points on Jan. 11 here against San Diego State. "They have so many weapons — they have size, length, athleticism," K-State coach Bruce Weber said. "If you let them get going, then that happens." I think I was calmer than (the) last game and the games before that. I’m just really letting the game come to me now. And I have my teammates by my side to calm me down the whole (time) by making plays and easy shots. 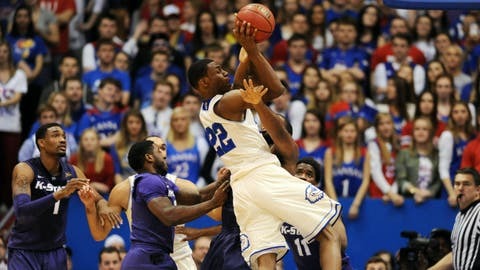 This happens, too: With 12:32 left of an already non-competitive Sunflower Showdown, Wiggins reached out with those Mr. Fantastic arms of his, pulled in a loose ball from out beyond the top the circle, took about a step and a half, and went Human Torch airbone, throwing down an angry, one-handed jam in the face of Marcus Foster, the talented K-State freshman from Texas. The rim shook. The Phog roared. Was it something somebody said? "No, not at all," Spradling replied. "It was a clean game. I don’t think anybody cheap-shotted him or anything. So maybe he just came out with a little bit more fire than what he normally does." "I think I was calmer than (the) last game and the games before that," said Wiggins, who had drawn criticism from the message-board posse after a 9-point effort at Oklahoma last week. "I’m just really letting the game come to me now. And I have my teammates by my side to calm me down the whole (time) by making plays and easy shots." Weber had the 6-2 Foster guarding 6-8 Wiggins early on, a gamble that backfired on several occasions, given the difference in height and reach. Whereas the Kansas star played free and easy, Foster whiffed on nine of his 12 tries from the floor and was 0-for-3 from beyond the arc. "They are long, have some length, and stayed with him," Weber said of his freshman scorer. "He got his first shot blocked, and I don’t think we moved the ball well. Once they got going on (their) run, instead of moving and cutting, we just kind of dribbled around and that is not us." As for K-State highlights, well … KU big man Joel Embiid got ejected for elbowing Nino Williams with 5:49 left in the contest. That was about as wild as the final 18 minutes got. About as entertaining, too. "I’m sure you can watch television and get a replay," Weber said coolly. For his part, Self said he didn’t see the contact live. "You can’t do that," the Kansas coach said. "So I think it was a good lesson for JoJo and certainly a good lesson for our team to learn through JoJo. I told (the refs), ‘If he did it, get him out of here.’"
In their past three opening halves at Allen Fieldhouse, the Wildcats have been outscored by an average of 42 to 26 — or a margin of 16 down at halftime. It’s hard to win the fight when you’re already gasping from the canvas by the second round. "I think the crowd — it was a different place," said Spradling, the Overland Park native who’s 0-for-The-Phog in his K-State career. "You can’t hear anything, especially that first four minutes. And that’s something that really sets the tone for the game. And the last couple of years, we’ve really struggled (with) those first four minutes. (Saturday), we actually did a good job, and then we kind of let it get away from us. Their crowd is great. They’ve got a great stadium and they used it to their advantage." There will be better days for the ‘Cats, if only because they can’t get much worse than this. Up next, K-State gets a pair of winnable home tilts with Oklahoma (13-3, RPI rank of 22 as of Saturday morning) and West Virginia (10-6 as of Saturdaymorning, 69) that could — if they can get the taste of this one washed out — allow a chance to get right back up on the horse again. "We have to put it behind us and we have to defend at home and defend our home court," senior forward Thomas Gipson said. "That’s the good thing about the Big 12 — you get back-to-back games, so you can’t rely on the last game you played. You always have to play the next game." Self, meanwhile, can see if this garden party sets the tone for two of KU’s bigger conference tests — a visit to KU-unfriendly Iowa State (14-1, RPI: 4) late Monday night and a date with Oklahoma State (13-2, RPI: 15) Saturday in Lawrence. During last winter’s Jayhawks-Pokes showdown at the Phog, the Cowboys won in a stunner and Marcus Smart did his Ozzie Smith impersonation right there on the hallowed hardwood. "You know, we beat (the Cyclones) three times (last season) — two of them, we actually, basically lost the game, and somehow won on the scoreboard … so they’ll be hungry for us," Self said. "They lost a tough one (at Oklahoma), so they know just how important it is (for both teams). It’ll be the most emotional game we’ve played in." Speaking of emotion, what did get into Wiggins, anyway? "Maybe (it was) the rivalry," Spradling said. "Maybe the coaches got into him." Maybe it was the posse. Maybe it was the pressure. Maybe it was the hype. Then again, maybe it was something else. "Like Coach (Self) mentioned (Saturday) in the locker room, we have eight more games to play in Allen Fieldhouse," the normally laconic Canadian said. "So I’m trying to enjoy every one of them."